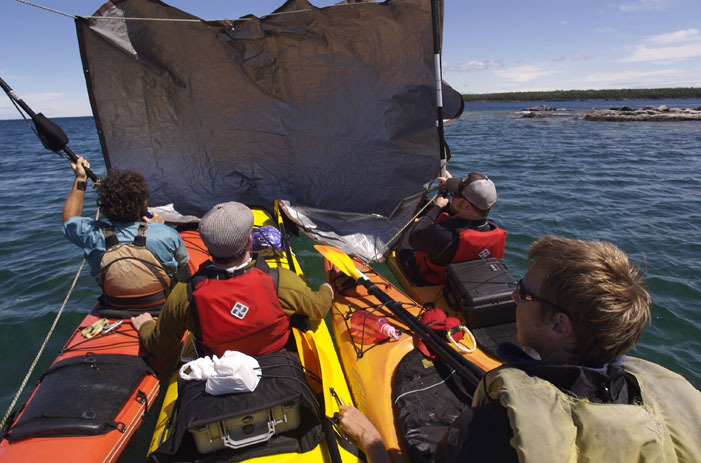 Kayaking the Bruce Peninsula sounds like a good idea if you know what you’re doing. The problem with hanging out with easygoing dudes is you’re constantly forced to act as though things aren’t a big deal. 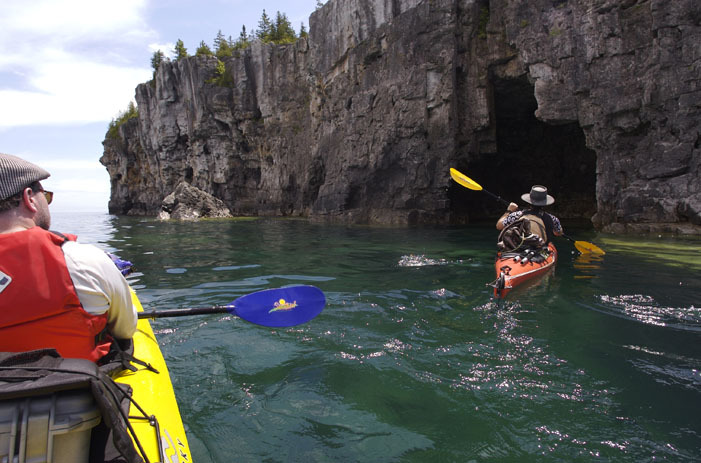 So when we put together the annual Mountain Life kayak trip from Tobermory to Cabot Head, the fact that I had never really kayaked before was ignored. In reality, I felt about as steady in a kayak as I do standing on a windsurfing board. Which, by the way, isn’t very steady. Add to that a steady wind, four-to-five-foot swells, a couple thousand dollars worth of camera gear and the foresight to pack nothing but cotton and it seemed I hadn’t quite think this through. And as we paddled with all our strength out from Big Tub Harbour and into the crashing swells, I began to wonder if acting chilled out about this was a good idea. Had I actually bitten off more than I could chew? Sure these guys were confident in their own abilities, but what about mine? Had anyone considered how terrifying it can be wobbling uncontrollably, as wave after wave crashes across your bow? Had anyone thought about the fact that swimming to shore in the icy water of spring is potentially life-threatening? The trip, which in theory offers the best possible vista of coastal Niagara Escarpment, took us out of Tobermory, past Fathom Five National Marine Park and down the length of Bruce Peninsula National Park, an area notorious for bad weather and shipwrecks. Giant pebble beaches line the shore and massive cliffs rise from the water where they meet the thick cedar and mixed forests of the Peninsula. The aquamarine water looks Caribbean but in the spring it’s downright frigid. 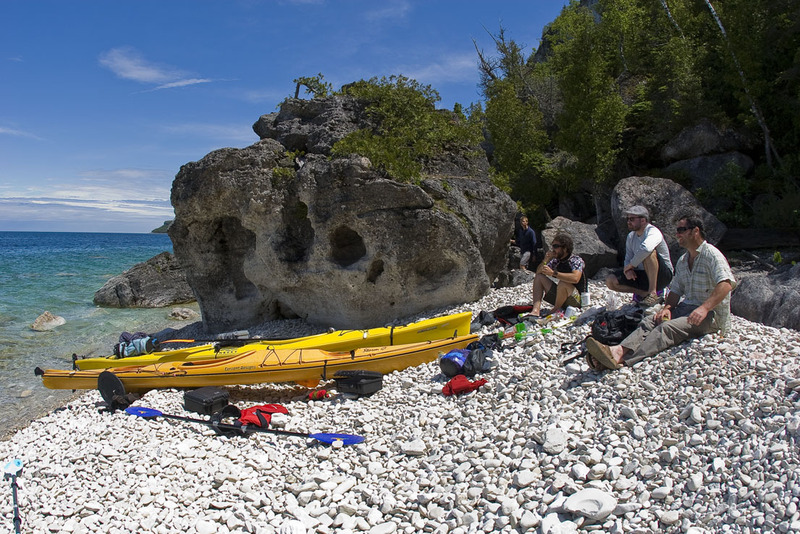 Bruce Peninsula National Park (one of only 42 national parks in Canada) is the largest remaining chunk of natural habitat in southern Ontario. Four hundred million years ago the region was covered by a shallow tropical sea and contained a reef similar in size to Australia’s Great Barrier Reef. The sea has since dried up and fluctuating water levels over millennia have eroded the limestone and dolomite of the Escarpment creating great caves and multi-featured shorelines. With 43 of Ontario’s 60 orchids found on the Peninsula, and thousand-year-old cedars clinging to the cliffside (in 1988 Dr. Douglas Larson of the University of Guelph discovered an 1845-year-old cedar on Flowerpot island), Bruce Peninsula National Park is a true gem of Ontario’s beauty. Thankfully once we rounded the bend out of Big Tub Harbour, the wind was at our backs. Which meant we were rolling with the four-to-five-foot swells as they pushed us gently on our way. And we soon realized we could use the wind, too. Barging up together we fashioned a sail out of a tarp and our paddles and we cruised along at a mellow clip for the rest of the day. Being barged up felt safer than being alone. When we finally disbanded and rode the sketchy sideshore waves onto the rocky beach for the night I wobbled uncontrollably with amateur nervousness, successfully filling my boat with water and drenching my sleeping bag. It was going to be a cold night. But Mennonite sausage from Meaford’s Market sizzling on a frying pan, fine scotch and good conversation around a campfire (and friends willing to lend you dry clothes) will keep anyone warm through the night. In the morning we packed up slowly and once again were blessed with blue skies and the wind at our backs. And we had another successful day of sailing. Stopping along the shoreline we explored nameless caves that went deep within the Escarpment, discovered old iron boilers from boats that had wrecked on the treacherous seas of Georgian Bay and enjoyed the pristine waters and amazing views of Ontario’s rocky spine. As we set up camp just outside Rocky Bay, the full moon casting its blue-light glow across our rocky campground, I absorbed the warmth of the stove. I couldn’t help but appreciate the versatility of the kayak. We were on a beach that was as empty as could be and we’d barely seen any signs of humans for two days. It felt as wild as Southern Ontario could get. And the only way to get to this spot was by kayak. Cabot Head’s dark profile, our final destination, loomed in the distance against the starry sky. In the morning, when I sat in my kayak and rolled down the slope of the pebbled beach into the cold water of the Bay, for the first time since the trip began, I didn’t wobble uncontrollably. I finally felt somewhat comfortable in a kayak. 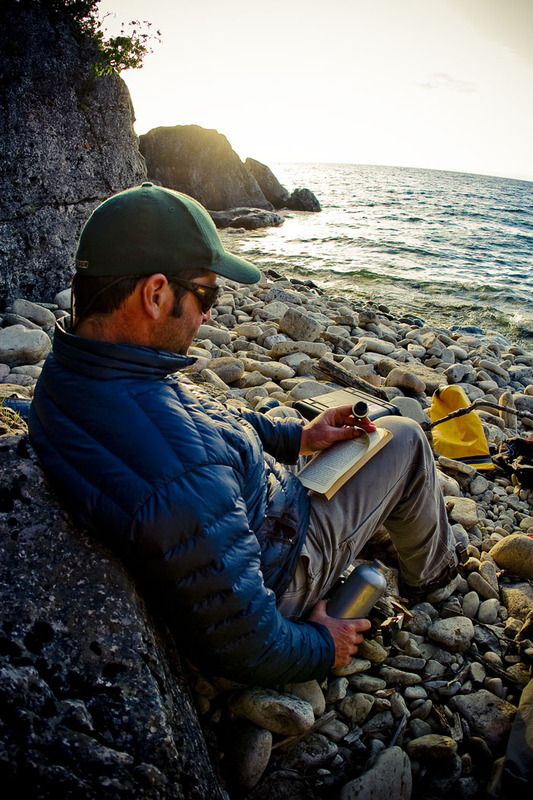 And I felt confident I’d be exploring the shorelines of Georgian Bay by kayak again; as soon as possible. Thankfully, two of my five companions were trained kayak and whitewater rafting guides. And I wouldn’t have done this trip without them. Although the weather co-operated with us, a shift in weather could turn this trip catastrophic in an instant. Please consider your ability while planning this trip and if you have any doubts, hire a guide.